As some of you know, I’ve been digging into Greg Boyd’s new book, Crucifixion of the Warrior God As some of you have pointed out to me, he liberally cites my work in Disarming Scripture. So naturally, I hold a particular interest in Boyd’s most recent thoughts on the subject, both because the topic is very close to my heart, but also because I’m frequently referenced in the book. I am currently about half-way through the first volume. 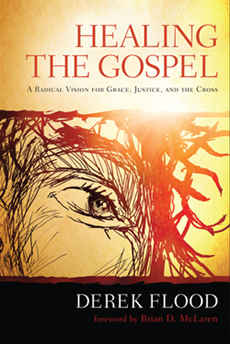 The first part if the book really impressed me, because Greg boldly confronts the problematic frequent OT depictions of a "violent warrior god," insisting we must "abandon all attempts to defend" these depictions, and instead "permanently crucify" this understanding of God, replacing it with an understanding of God revealed in Christ crucified. You can read my review of that part of the book here. Note above that Greg identifies my rejection of violent depictions of God on theological grounds, rather than historical grounds. I’ll return to that shortly, but first let me address the historical grounds that he identifies with Seibert and Enns. Greg does not actually disagree with the archeological evidence these claims are based on (extensive archeological findings in the later part of the 20th century have convinced the vast majority of scholars today that the genocide accounts recorded in the book of Joshua are largely fictional), but argues basically that the moral message of the text is not changed simply because the historical veracity of the account is disproven. I agree. The moral message remains horrible in these texts describing merciless genocide in God’s name. The portrait of God here remains awful. What is significant is that if the genocide accounts are a fiction, this makes it rather clear that the claim that God commanded them is equally a fiction. This matters because many biblical accounts use the evidence of miracles to back up their position. So we ask, if genocide is wrong, then why did God cause the walls of Jericho to fall down as the Israelites marched around them allowing them to then slaughter every living thing inside in the name of the Lord (Joshua 6)? When we learn from high-precision radiocarbon dating that Jericho was destroyed more than a century before Joshua ever got there, that kind of changes things. God, in fact, didn’t say this and didn’t do that because the entire thing simply never happened. I’m not sure what Pete would say about this charge (I’m hoping he blogs about it soon), but I am fairly certain he is misreading Eric’s position, and I certainly can say that he is misreading mine. As I read it, Eric Seibert’s larger goal is to develop a Christocentric hermeneutic, which is incidentally what Greg has been working to do as well thus far in his book. This is also my goal in Disarming Scripture. 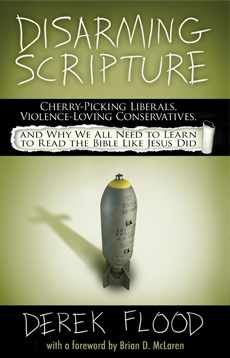 Namely, I reject committing violence in God’s name (which is not quite the same as rejecting “violent depictions of God” since it focuses on our moral actions, rather than on our theoretical understanding, meaning my core focus is practical, focusing on how we live) by adopting the way Jesus and Paul read Scripture, who both also rejected justifying violence in God’s name. Greg avoids using the word “reject” although this is for all intents and purposes practically what he is doing. Along these lines he states that “We certainly ought to reject their violence” but that we “must do this in order to look past the surface meaning” (451). In other words, as far as what these texts actually say, as far as what the biblical authors intended them to say, Greg agrees we should reject them. He however wants us to continue to look deeper to find a hidden message beyond this. An evaluation of whether he successfully can show this hidden message will need to wait since Greg has not said anything about this yet in the book. So Jesus “repudiates” Scripture. Repudiate is a synonym for reject. So Greg could have just as easily written that I “repudiate violent depictions of God primarily on theological grounds” and added by the way that Jesus does, too. This may “conflict with many people’s understanding of biblical inspiration” but that is nevertheless precisely how Jesus reads Scripture. Greg goes so far as to state that “This means to be considered a child of the Father in heaven by Jesus, one had to be willing to break the OT commands to retaliate” (73). However, Greg’s central claim is that his so-called “Dismissal Solution” “...assumes that the problem posed by biblical authors ascribing violence to God is to be solved by denying that this violence ever took place” (343), which Greg admits Marcion never actually said, “Contrary to a common misunderstanding of his position, Marcion did not reject the OT on the grounds that it was historically inaccurate or in any other respect untrue” (337). Why not instead claim that this perspective finds its origins in Anabaptism, since as Greg notes, they did actually make this claim (127). Since Greg is sympathetic to Anabaptism this would then be both more accurate as well as more generous. Let’s be honest, associating those of us who he groups in the “dismissal solution” with someone who was “uniformly branded as a heretic” really can only serve as a form of guilt by association. I would have hoped for Greg to show a little more care in his words. To be clear, I am frankly not terribly worried about being accused of being a heretic. Looking at church history I observe that the heretics were usually the good guys. However, it is meant to discredit, and I’m sure that since Greg has surely been accused of being a heretic plenty of times and is surely not happy about that, I would appeal to Jesus’ motto of “do unto others as you would have them do unto you” here. It strikes me as rather self-evident that if a person writes an entire book on a subject, they can hardly be accused of not taking it seriously or of simply “dismissing” it. So how about we call it the “Repudiation Solution” instead, and you can call mine the “Repudiate Like Jesus Does Solution” or if you prefer, “Cruciform Repudiation” which does sound a lot catchier. Greg is certainly welcome to disagree with me and others (as I’m sure he disagrees with those Anabaptists). I also welcome his attempt to build further upon the work we have done, taking it to places beyond where we were able to go. However, I wish he would then frame it in that way. Indeed, the only way one would be able to somehow look beyond what the texts say to find this “deeper” meaning, as Greg aims to do, is by first identifying that the “surface” meaning is in conflict with the God revealed in Jesus. In that sense, the work that I and others have done can be seen as building the foundation for what Greg aims to do. So why not suggest that he sees the need to build further, rather than seeking to repudiate and discredit what we have said? Why the stress on framing Seibert, Enns, myself, and others as rivals to him? It seems so unnecessary, and indeed unfortunate. Again, as I mentioned earlier, Greg has not yet made his case for how to find this “deeper” meaning hidden in the text. So I will keep reading. Continue to Part 3. Go back to Part 1. UPDATE: Greg has responded to this review on his blog, and also on his podcast (the part with me begins at a little after 3 minutes in). Although I'm pretty sure it was recorded earlier, I actually found what Greg said on the podcast more helpful than the blog. He reflected that perhaps he had been too "harsh" or "pejorative" saying "It's always good to question yourself, and maybe I overplayed that." He also clarified that while he agrees that we must reject violent OT passages as being incongruent with the cruciform God, he sees this as a stepping stone which should lead us to wrestle with the text as part of our sacred Scripture seeking to understand how even this can point us to Christ. I appreciate him being reflective and gracious and agree that we should always question ourselves (I hope I can exhibit that too! ), and I also appreciate him challenging all of us (myself included!) to continue to dig and wrestle with these difficult texts. Wow! Putting you and Enns in the Dismissal camp is a highly questionable move. I haven't read that chapter yet; I'm only on p. 200. I love your work, and I present it in my seminars as more in the camp of progressive revelation, since you present God as on a journey with us to heal our tendency for retributive justice, progressively revealing God's justice to us as restorative. I did read ahead to the end of ch. 9, where he takes on the "Progressive Revelation" camp under the category of Synthesis -- which is where I would put my own position. At least there he says that his own position can be viewed as a new version of progressive revelation. I consider my own approach to also be a new version, one based on anthropology, as I commented on under your First Look at the book. As I understand the "synthesis" approach, it consists of creating our image of God based on a synthesis of the God revealed in Jesus + the pagan genocidal warrior god found in parts of the OT. I don't get the impression that this would be your position. So I imagine you must mean something else. FWIW, I don't think progressive revelation actually fits into the "synthesis" category since it is not a synthesis of images but a progressive revealing of the image of God. I heartily agree with your view that progressive revelation should not be placed under "Synthesis" with other views diametrically opposed to it. Another highly questionable move by Boyd. He sees his as progressive revelation but doesn't really place it under Synthesis. He might provide the same courtesy to other versions of progressive revelation. I mention above that our approach is incorrectly labeled as "dismiss" and say it should be instead called "repudiate." Another term could be "confront" in that it acts to confront the problematic texts. This repudiation/confrontation is the opposite of dismissing. It does not dismiss or ignore or in any way suggest that there is not a problem. Instead it insists that there is a problem and we must own it and face it. We need to face that these texts have been used to justify hurting other (for example justifying genocide) in the name of our God. To do anything less than to confront this is to read the text naively/irresponsibly. I made a point of looking at the work of every author he put in the "dismiss" camp, and can now say that all of them fall into the confront/repudiate camp. Boyd in framing things as if we were all basically saying "problem solved, now you don't need to face this" falsely represents us as saying the polar opposite of what we are actually saying. We are all saying "problem identified, you must face this." One of my pet peeves is how quick many Christians are to cry "Marcionism." Marcion is more clearly an example of Dismissal. I prefer your nomenclature of Repudiate/Confront for those who do so without calling for dismissal of large chunks of Scripture -- usually with some form of progressive revelation as the reasoning behind repudiation. I think Boyd is quick to lump others in with Marcion because of his conservative version of scriptural inspiration as "God-breathed." Derek, I agree that the turn taken by Boyd in chapter 8 is very disappointing. It seems to me that, in his desire to be able to hold up his own proposal (covered in Volume 2) as the comprehensive solution to the problem of OT divine violence, Boyd feels compelled to dismiss any other view. Thus, if it doesn't fit the "synthesis" category, it goes in the "dismissal" can. It's a completely false categorisation. Derek, I am just finishing the first book. I can see how Greg seems to have misrepresented your position. But I think he also honored you and others, and upheld the convictions of those have taken a different approach on how to resolve these 'sub-Christ like' portions of Scripture. In the end I think you and Greg agree, but take slightly differing paths to the belief that these Scriptures must not be taken at face value. I am hoping that Greg's solution might be a bridge to some who are more conservative in their understanding of 'Biblical inspiration.' I think authors like you, Greg and Enns are all working toward a more Christlike view of God in the Old Testament. More power to you all! Greg is trying hard to find a solution that won't get him booted from the evangelical camp. He's been tiptoeing around the edge for quite a while and one false move will make him the next Rob Bell. I believe he genuinely does not want to go as far as you, Pete, and others have, but like you say in the review, for all intents and purposes he already has and it seems he's just using semantics to suggest otherwise.